iTunes is a fantastically fully-featured piece of software, but it can easily frustrate. So we've found six great add-ons you can use with iTunes for OS X. Whatever Mac you use, whatever the size of your music collection, we're sure you'll find something of interest here - you can access all the niggly options Apple tries to hide, perfect your album artwork and constantly see what you're playing. Talking of which, here's the first in our list. Although there are plenty of iTunes notification apps, they mostly take up valuable space on your computer's screen or get hidden by other windows. However, with modern Macs having widescreen displays, you often have space to spare in the menu bar along the top. iTunesMenu makes use of this space by enabling you to display the name of the song currently playing in iTunes, along with other information, such as the artist and album. The application's drop-down menu also provides access to basic iTunes controls, although we recommend your Mac's keyboard for those. As with Mac OS X itself, Apple 'hides' a number of preferences from iTunes users, not making them accessible via a graphical user interface. iTunes Preference Pane installs into System Preferences and provides a number of options for tweaking iTunes. Perhaps the most useful setting is Invert Library Links, which turns the library arrows into links to your own library rather than the iTunes Store (Option-click for the default functionality). The ability to apply halfstar ratings will benefit anyone who considers Apple's out-of-five system too restrictive. Note: change settings when iTunes isn't running. Even if you've only a modest music collection, the thought of rating all your tracks might seem overwhelming. However, a rated collection provides more scope for smart playlists, and I Love Stars enables you to rate as you go. Launch the app and it sits in the menu bar, showing the currently playing track's rating. To change the rating, click on the relevant star. Ctrl-click to access the app's preferences, which enable you to define system-wide rating shortcuts. You can also optionally activate alerts, so I Love Stars flashes and plays a sound when an unrated song is almost done playing. Bowtie is conceptually similar to iTunesMenu, but instead of showing the name of the current track in text form, it displays the parent album's artwork. Via Bowtie's preferences, the artwork window's depth can be defined (Desktop level, Normal, or Always on top). Bowtie also includes two alternate themes: one is purely text-based, while the other shows a tiny vinyl record poking out from behind the artwork (and utilises a popup to access track info). Additional themes can be downloaded (search Google for 'bowtie theme'), or if you have knowledge of HTML and CSS you can make your own. Lounge is an interesting mix of screensaver and iTunes kiosk, perfect for parties or just as a good-looking screensaver for any Mac. Instead of iTunes-style visualiser pyrotechnics, Lounge displays the current track's artwork and information. Options enable you to toggle keyboard control for skipping tracks and adjusting volume without exiting the screen saver, and you can also set the screen to flip periodically, to reduce the chances of screen burn. Another option enables you to define an alternate screensaver to switch to when the current playlist ends. 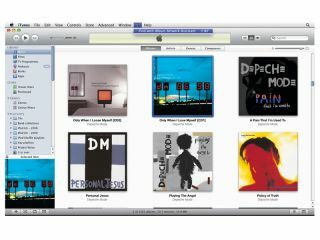 Various widgets exist for finding artwork for iTunes tracks sporting the default musical note cover. Album Artwork Assistant beats its rivals by being comprehensive and offering plenty of choice regarding potential artwork to import. Usefully, the application also provides a queuing system for when you'd like to work through a bunch of albums, rather than immediately applying new art every time. To use this feature, switch Add Immediately for Add to Queue in our walkthrough, and when you're done open the Queue draw and click Process Queue. There's a handy walkthrough below.